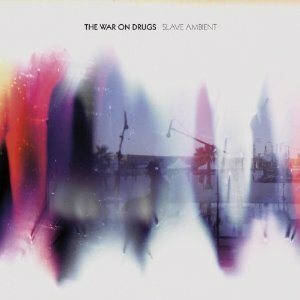 There’s a stage being set for an empty infield on the cover of Slave Ambient, the latest from phased-out Philly kit The War on Drugs. Behind the shifting marbles of red and blue and white, a solitary guy in a baseball cap is captured in motion. But the guy isn’t the point; he just happens to be standing at the center of the thing. The War on Drugs–primarily singer and guitarist Adam Granduciel–broke in with 2008’s undernoticed Wagonwheel Blues. That record was bolstered by the work of a then-little-known Kurt Vile, and was grounded by a set of anthemic stompers that found Granduciel woo-hoo-hooing and philosophizing like Springsteen over sculpted, foaming feedback. While Slave Ambient retains that album’s broad scope, it’s missing the big-time choruses and singalong verses that kept Wagonwheel Blues grounded. But what the record lacks in interaction it makes up for in texture. Slave Ambient is a whorl of bright sound–layers of milky phase-shifting, synths that inhale and exhale at a resting rate, snares that pound like oil derricks, and an acoustic guitar that Granduciel strums like he’s piloting a ship through a storm. He bends his nasal tenor, stretching words like Dylan and dampening his melodies like Petty. It’s a record that is thoroughly confusing and confounding, a squall of debris built on the seemingly-feeble chassis of simple folk songs. Where Wagonwheel Blues brought us up the 101, Slave Ambient avoids roads altogether. It’s more content to swirl around and over us, to mystify and engage us. As with its cover art, obfuscation is half the point. Which isn’t to say that there’s nothing to hold onto here. Slave Ambient’s wide stage gives it a strange sense of place. The songs feel as though they’re unfolding against something, like they exist in some kind of context to which we’re not privy. We fade in on them already in progress, fade out before they fully resolve, and move on, as if we’re being guided through a series of anonymous rooms in which these songs are always being played. The record’s rhythm rarely shifts for more than a few bars before returning to the thrum that serves as the bedrock for most of its duration. Massive synths rise against slickly-laminated guitars in the instrumental “Original Slave,” nearly drowning out the rest of the track with a single tone that seems to shift in color–it begins with all the fury of an industrial-strength air conditioner, but, as it pushes against the band’s playing, it seems to evolve until it mimics a humming bagpipe. But the sound doesn’t actually change, only the way we hear it; repetition paradoxically renders it more interesting. i guess i’ll have to spend time with it because after the first listen i was completely bored. i know i play for WoD’s team and i’m biased and all…but this is one of the best reviews of the record i’ve read yet. Meh! It’s alright they could have done better. One of the best records of the year, easy. I just got into this record.